Cape Town to Windhoek flight bookings qualify to earn SouthAfrica.TO flight discount vouchers - merely email cheapflights@southafrica.to a writeup of your CPT-WDH flight, including photos, and we'll send you travel vouchers. Avis & Europcar offer car rentals from Windhoek's Hosea Kutako International Airport. So, you want to fly from South Africa's Mother City to Namibia's capital city. It's only Air Namibia operating direct flights from Cape Town to Windhoek, and the 1-stop options are not attractive (too much of a detour via Johannesburg), and a drive from Cape Town to Windhoek is excruciatingly long. So, use the flight bookings tool on the left to compare the airline prices. South African Express used to fly from CPT to WDH, but quit the route on the 15th May 2014, citing "sustainability". International flights to Windhoek are to Hosea Kutako International Airport. Don't be shy - Ask for Assistance - our travel consultants are itching to show you the best flight deal! 25 Sep 2015. Following the success of their Lanseria - Windhoek flights, FlyAfrica finally announced a launch date for their Cape Town-Lanseria flights. From the 2nd of November 2015 they will fly between Cape Town and Windhoek on Mondays, Wednesdays and Fridays. 11 Sep 2014. SA Airlink is re-introducing direct flights from Cape Town to Windhoek on the 6th of October 2014. 15 May 2014. 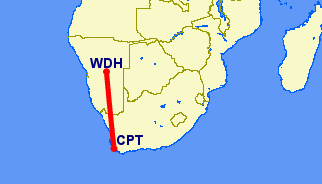 SA Express discontinues its CPT-WDH flights. 1 May 2013. Air Namibia flight SW702 now leaves Cape Town at 05:00 UTC (until 31 August 2013). 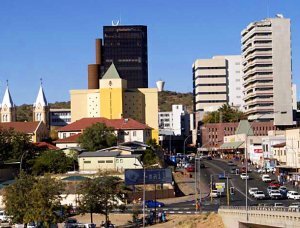 We also have a Johannesburg to Windhoek flights (it's sometimes cheaper to do a 1-stop flight from Cape Town to Windhoek via Johannesburg), and a general page for flights from South Africa to Windhoek. See our flights to Namibia, which fully covers flights from Johannesburg, Durban and Cape Town to Namibian destinations. You can travel from Cape Town to Windhoek by bus, bike or car. The route is along the N7 in South Africa past Malmesbury, Moorreesburg and Springbok; and then on the B1 in Namibia where you'll drive on some of the straightest roads in the world between Mariental and Keetmanshoop. An alternative method of getting from Cape Town to Windhoek is by bus. The Intercape Bus offers a regular bus service from Cape Town to Windhoek.